The de Lacy family built many Motte & Bailey castles throughout Ireland to hold the lands which they laid claim to either by conquest or Royal Charter. Below we share with you the three most prominent castles. The first and the most important de Lacy Irish power base. Known locally as King John's Castle, lies in the town of Carlingford, in County Louth, Ireland. The common name of King John's Castle is derived from the supposed rumour that King John stayed there for 3 days in 1210. Carlingford Castle stands on a rocky outcrop by the shore, overlooking the harbour. Built in the late 12th century by Hugh de Lacy Lord of Meath. It was the first fortified stone structure in Carlingford. The castle itself is a D-shaped enclosed castle. 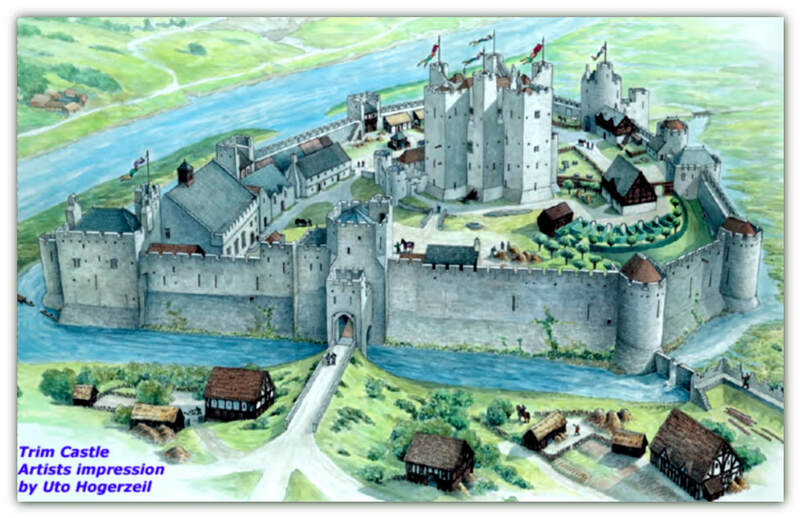 The curtain wall on the western side had a rectangular gatehouse and a square flanking tower. Portions of the northern tower of this gatehouse still remain. The curtain wall was well protected with deep embrasures with narrow defensive slits. During the second half of the 13th century, a large rectangular hall was added on the eastern side. This hall had two main floors over a basement which is now partly filled with masonry. The great hall sited on the first floor of the castle overlooking the harbour. Dundrum Castle, Dundrum County Down. Dundrum Castle, County Down. stands at the top of a rocky hill commanding fine views south over Dundrum Bay to the sea and the surrounding countryside. Built in 1177 by John de Courcy following his invasion of Ulster. The town of Dundrum grew in the shelter of the castle defences. Originally built as an earth & timber Motte & Bailey castle in 1177 it was seized by Hugh de Lacy at the request of King John I, in 1204. de Courcy was expelled from Ulster by King John. The castle was then taken by Hugh de Lacy on behalf of King John in 1210. Hugh now the Earl of Ulster strengthened the castle with a massive round keep, which you can see in the video. He probably employed master masons from the Welsh Marches, where such keeps were popular. ​Hugh de Lacy was was ennobled as the Earl of Ulster. Dundrum Castle became a de Lacy Castle and Hugh set about improving the castle and rebuilding in stone. Note from Roy, The Trip advisor page Dundrum Castle has a large range of Photos and comments. Tap or Click to have a Look. 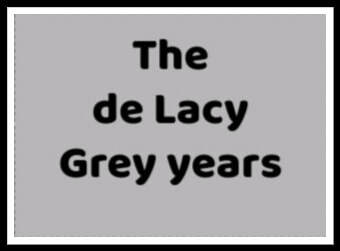 Following the end of the Baron de Lacy family, there was little or no recorded history to add to the de Lacy Chronicle. Happily, this was far from being the end of the family tree indeed you may consider it was the start of today’s Worldwide Lacy Family tree! Tap or click the Icon below to follow what we have found up to the 1600's where the recorded history re-appears. ​to a visit to any of the de Lacy Castles or Churches. If you wish to include photos* please submit both your text and photos by email to delacychronicles@gmail. *Include any permissions if the pictures are not yours. Thank you.